Mike Ashley and manager Rafa Benitez held talks at St James' Park on Saturday night, Sportsmail can reveal. The Magpies were 3-0 winners over Cardiff City to move out of the relegation zone and two points clear of danger. And after full-time a beaming Ashley headed for Benitez's office to offer his congratulations and re-open a dialogue with the Spaniard. Sportsmail reported on Saturday that the owner was keen to re-engage with the boss, who remains frustrated by a lack of progress in the transfer market this month. But with Ashley now close to conceding defeat in his effort to sell the club, the pressure is on to provide the players Benitez believes they need to stay in the Premier League. Ashley was joined by close aide Justin Barnes during the discussions with Benitez, and supporters will be hoping promises were made. Benitez's contract expires at the end of the season and he would need the team to survive and guarantees from Ashley over future investment before he commits to a new deal. 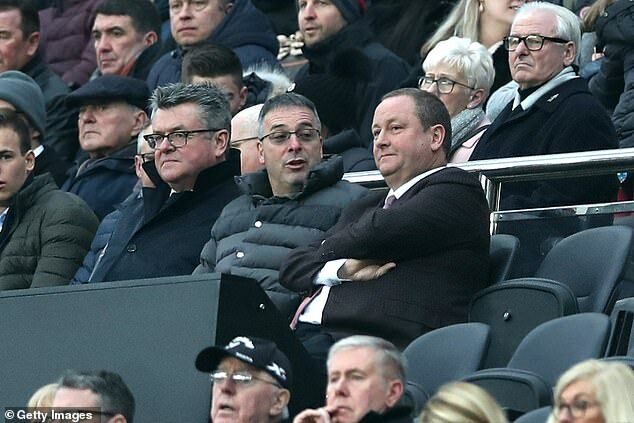 Ashley was last at St James' Park in November, since when he has been unable to sell the club with none of the interested parties having the financial means to fund a deal. This is the first time he has spoken to Benitez since the autumn.